At 416 feet (127m) wide, spanning the width of an entire city block, Avenida 9 de Julio is claimed to be the widest avenue in the world. Named for Argentina's Independence Day, which falls on 9th July, the avenue was originally planned in 1888, but actual construction only began in 1935 after many disputes with landowners. While the initial phase opened for public use in 1937, the avenue was only fully completed in the 1960s, with the southern connections only completed after 1980. The avenue runs from the Retiro district in the north to Constitucion station in the south, roughly one kilometre to the west of the Rio de la Plata waterfront, and consists of 18 lanes of traffic, nine on each side. 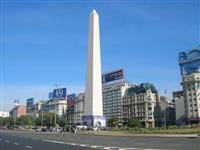 In the middle of the street stands a 67-metre-tall obelisk marking the heart of Buenos Aires. The obelisk is a popular photo spot, and visitors can climb to the top where they can look out over the Avenida 9 de Julio through its four observation windows. Lines B, C, and D of the Buenos Aires Metro converge at a station located on the pedestrian underpass below the obelisk, and the underpass also serves as a retail concourse. It can take quite a while to cross the avenue on street level as opposed to using the underpass, since there are traffic lights at each intersection, which can slow a pedestrian's crossing.